The common myna (Acridotheres tristis), also called the Indian myna, is a highly commensal Passerine \nthat lives in close association with humans. It competes with small mammals and bird for nesting hollows and on some islands, such as Hawaii and Fiji, it preys on other birds' eggs and chicks. It presents a threat to indigenous biota, particularly parrots and other birdlife, in Australia and elsewhere. Mynas are distinctive birds in that they move about in a walk rather than a hop. Like most territorial birds they have a bout of intense calling in the early morning that lasts between 5 and 15 minutes. Males call more often than the females, and pairs sometimes duet. The territorial call is a rowdy medley of creaky notes, growls, rattles, raucous, gurgling, chattering and bell-like sounds in rapid sequence often strung together as a song. Adults with young utter harsh squarking noises and young learning to fly emit persistent \"chi-chi-chis\". At their communal roosts mynas maintain a noisy chattering, even well after nightfall and before dawn. To hear samples of the common myna call please go to: Tidemann, C. 2007b. Common Indian Myna Website > Identiying Mynas. The common myna is highly intelligent and acquires a fear response; it learns about an area in which it observes another individual experience an aversive event, namely capture by a human. This obviously has implications for management and control (Griffin & Boyce 2009). The female myna incubates her eggs for 13 to 14 days. The fledging period lasts between 20 to 32 days, averaging 25 days. Parents feed the chicks as long as three weeks after they have left the nest (Massam 2001). Sexual maturity occurs at nine to 12 months. Juveniles form small flocks and may form mating pairs at as young as nine months old although few breed in their first year. Life span is an average of four years in the wild, possibly up to 12 years for some individuals (Markula Hannan-Jones & Csurhes 2009). In India the common myna is referred to as the farmer’s friend because it protects crops by feeding on insect pests. In fact the myna has been deliberately introduced to continental landmasses and islands with warm temperate to tropical climates ostensibly to control invertebrate pests (Case 1996, Veltman et al. 1996, Feare & Craig 1998). Many myna species are accomplished mimics and can be taught to speak; for this reason the myna is a much sought-after pet in some parts of the world (Tidemann 2005), in Mallorca, Spain, several pet birds have escaped or been released into the wild. Common mynas are found in both tropical and temperate regions, from the tropics to southern Europe (Russia) and as far up as northern France (Feare 1998). They are able to adapt to a wide range of climates and habitats. They inhabit flood plains, grasslands, cultivated areas, plantations, as well as desert oases and foothills of various mountainous ranges (Feare and Craig, 1999). However, in general, the common myna reaches the highest densities in modified habitats near human establishments, including cities, towns, villages, farmland, rural dwellings, parks, gardens and roadsides (Gill 1999; Heather & Robertson 2000). The common myna evolved in open woodland habitats in India (Sengupta 1968, in Pell & Tidemann 1997) and is said to prefer anthropogenically modified woodland in Australia (Tildemann 2007e). The common myna is good at adapting to local environments. For example, in Fiji it congregates on the seashore feeding off crustaceans and other stranded sealife and has even colonised a small coral island. In Singapore it is strongly associated with the rural landscape, for example, agricultural and farm areas (Lim Sodhi Brook and Soh 2003). In Australia mynas prefer reserve habitats, especially the perimeters (Pell and Tidemann 1997). While reserves provide excellent environs for the myna in Australia and stimulate large numbers of mynas during the breeding season, during the winter months mynas find refuge in the surrounding suburban areas (Pell and Tidemann 1997). The common myna prefers warmer climates. For example, in New Zealand, it tends to avoid colder regions in the south such as Nelson; but interestingly it does establish stable populations near piggery sheds where sufficient heat is produced by the pigs to maintain a relatively high temperature; in addition there is an abundance of pig food available (P.R. Wilson Pers. Comm.). The common myna prefers to forage in open, grassy habitats (Crisp and Lill 2006, in Newey 2007), either in groups or alone, and roost in isolated stands of tall trees. In Singapore, it commonly roosts among monoclonal stands of tall densely canopied trees (Hails 1985; Yap et al. 2002). In Fiji, less densely canopied trees such as coconut palms are chosen by the adaptable bird for roosting and refuge (Stoner 1923). The common myna stays in the same pair and maintains the same territory each year. It builds a cup-shaped nest out of dry grass, twigs and leaves and may construct its nest in a tree hollow, cliffside, building or thick vegetation. The common myna usually raises two broods per season, laying up to six pale greenish-blue eggs (3.1cm x 2.2cm; Massam 2001) in each brood, with an average of four. Both sexes brood and care for the young (Massam 2001). In New Zealand they lay eggs from mid-October to early March, with the highest egg-laying activity occurring from November to January. In Australia up to three broods of young may be produced in one season. Both sexes brood and care for the young (Massam 2001). Common mynas are highly adaptable to human habitations (Sontag & Louette 2007) and local food resources. For example, they has been known to consume pet food (Australian Museum 2003) and forage on the seashore for worms, molluscs, crustaceans and other seafood stranded on the mud flats (Stoner 1923). They also scavenge rubbish dumps, pastures, farmyards and roads for roadkill. They are predominantly ground feeders, pecking prey from the surface in short pasture and grain stubble, but will opportunistically feed in flowering or fruiting trees and bushes (Feare and Craig 1999). In their native range of southern Asia the myna forms flocks in rural areas, which feast on insects and grubs turned up in the cultivated soil by the plough (Australian Museum 2003). In Israel, mynas escaped from a private facility of exotic birds in the centre of the Tel Aviv public park.On oceanic islands, invasion pathways appear to be primarily via ships, particularly large ferries (Tearika 2003, D. Wattling Pers. Comm. ).The pathway to the Spanish islands has been through pet shops and later escapes from the home cages.Introduced by acclimatisation societies. Recommended citation: Global Invasive Species Database (2019) Species profile: Acridotheres tristis. Downloaded from http://www.iucngisd.org/gisd/species.php?sc=108 on 22-04-2019. Flocks of the common myna are known to damage fruit crops, including grapes, apricots, apples, pears, strawberries, figs and gooseberries. (Heather and Robertson 1997). \r\nMynas are communal and commensal, they are highly vocal throughout the year, making them a public nuisance. Their droppings are a nuisance (Yap et al. 20002, in Lim Sodhi Brook and Soh 2003) and public health concern. Mynas form combined populations of up to 160 000 (Lim Sodhi Brook and Soh 2003) and roost in numbers as great as 5000 (Markula Hannan-Jones & Csurhes 2009). They are a residential nuisance as they build nests in spouting and drainpipes (Stoner 1923). Mynas fearlessly steal food off plates which may be a hygiene or general nuisance for restaurants and other shops and scavenge food from people’s houses and gardens. Common mynas pose a human health risk as they carry bird mites such as Ornithonyssus bursa and Dermanyssus gallinae that may infect humans. They can also cause dermatitis, asthma, severe irritation and rashes. Their droppings can spread Psittacosis, Ornithosis, Salmonellosis and arboviruses (Pers. comm. Bill Handke). They may also carry owl flies, biting lice, Oxyspirrura thread worm and round worm (Stoner 1923). Mynas are known to carry avian malaria (Massam 2001). The common myna has been implicated in the demise of the lowland populations of the 'Vulnerable (VU)' Rarotonga starling (Aplonis cinerascens) (BirdLife International 2008b). Mynas are nest site competitors and can displace active breeding pairs of the Endangered (EN) Mauritius parakeet (Psittacula eques). In French Polynesia they are reported to predate on the Critically Endangered (CR) (Todiramphus godeffroyi). Please follow this link for more examples of the impacts of common mynas on threatened species. Preventative measures: Risk assessment models by the Bureau of Rural Sciences, Australia, classifies the common myna in the highest threat category (Bomford 2003). The common myna is prohibited in Western Australia (Massam 2001). Physical: Foraging traps are very useful for the control of small myna populations if poisoning is not an option. The Tindall Trap and the Tidemann Trap have been used successfully in New Zealand and Australia, respectively. The Decoy Trap, Kadavu Trap, Larsen Trap, Rat snap-trap and other foraging traps have also been used for trapping myna birds with less success. Please follow this link to view a plan of Peter Green's starling, sparrow and myna trap is available . Mynas roost in large concentrations and netting operations and nest trapping may be appropriate for control. Mynas should be provided with food, shelter and perches in cages a few days prior to trapping. Mynas should be killed humanely by euthanasia with carbon dioxide (Thomas 2004). For more information on humane trapping and disposal of birds please see the Tidemann, C. 2007f. Common Indian Myna Website > Trapping Mynas and Tidemann, C. 2007g. Common Indian Myna Website > Humane Disposal. Integrated Pest Management: As invasive bird species are frequently associated with human modified environments IPM is an appropriate strategy (Lim Sodhi Brook and Soh 2003). Long term management practices may include habitat modification, resource limitation and public education. Restricting food available to the myna is difficult as it has such a variable diet (Thomas 2004). The need to raise public awareness is important part of IPM. Envirotalk Australia has a forum discussion on the myna topic. The Minimising Myna Website aids public education on the issue. The Canberra Indian Myna Action Group is a community group that has developed a number of strategies, including public education and a trapping program, to tackle the common myna. CIMAG's trapping program has been highly successful and has humanely removed over 12 000 Mynas from around Canberra in around 18 months (CIMAG Undated). Research: Kate Grarock is undertaking a PhD research project at Australian National University on the impact of Indian Mynas on native birds and the impact of trapping activity in the Canberra region. Informations on Acridotheres tristis has been recorded for the following locations. Click on the name for additional informations. ACT 2003. State of the Environment Report 2003. Indicator�Pest Animals. Australian Capital Territory. Hails, C. J. 1985. Studies of problem bird species in Singapore: I. Sturnidae (Mynas and Starlings). A report submitted to the commissioner for Parks and Recreation, Ministry of National Development, Singapore. Summary: Notes on invasive characteristics. Hatzofe, O. and Perelman, Y. 2001. Myna trapping trial report: summary and recommendations. Israel Nature and Parks Authority internal report of the Science and Conservation Division. 4pp. Hughes, B.J., G.R. Martin & S.J. Reynolds. 2008. Cats and seabirds: effects of feral Domestic Cat Felis silvestris catus eradication on the population of Sooty Terns Onychoprion fuscata on Ascension, Ibis 150(Suppl. 1): 122-131. Kang, N., Sigurdsson, J. B., Hails, C. J., & Counsilman J. J. 1990. 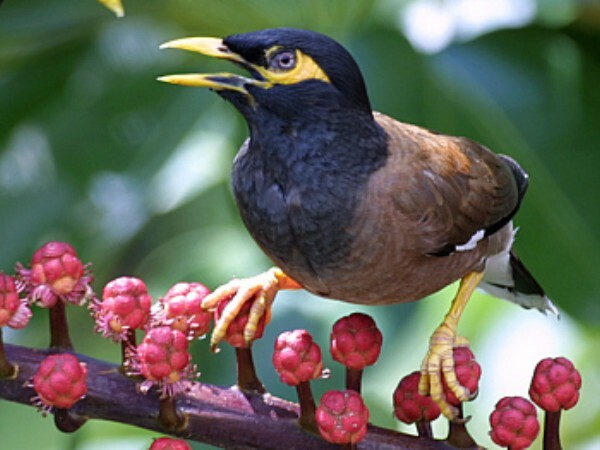 Some implications of resource removal in the control of mynas (Acridotheres spp.) in Singapore. Malayan Nature Journal 44: 103-108. Summary: Long term management issues. Lim, H.C., Sodhi, N.S., Brook, B.W. and Soh, M.C.K. 2003. Undesirable Aliens: Factors Determining the Distribution of Three Invasive Bird Species in Singapore, Journal of Tropical Ecology 19: 685�695. Summary: Land use in Singapore and the presence of invasive birds. Live Arico. 2007. First Campaign for Common Myna (Acridotheres tristis) Control in the island of Mallorca 2006. Markula, A., M. Hannan-Jones & S. Csurhes. 2009. Pest animal risk assessment Indian myna Acridotheres tristis. Queensland Government. Millett, J, Climo, G & Jivan Shah, N. 2004. Eradication of the common myna Acridotheres tristis populations in the granitic Seychelles: successes, failures and lessons learned. Advances in Vertebrate Pest Management 3: 169-183. Nelson, P.C. 1994. Bird Control in New Zealand Using Alpha-Chloralose and DRC1339, Vertebrate Pest Conference Proceedings collection: Proceedings of the Sixteenth Vertebrate Pest Conference. NZFSA (New Zealand Food Safety Authority). Undated. home > acvm > publications > notes > Drc1339 Bird Study Notes: Controlled Pesticides: DRC 1339 For Bird Control. Parkes, J. 2009. Common Mynas (Acridotheres tristis) on the Three Kings Islands: Should and Can They Be Controlled or Eradicated? Pell, A.S. and Tidemann, C.R. 1997. The ecology of the common myna (Acridotheres tristis) in urban nature reserves in the Australian Capital Territory (Abstract), EMU 97: 141-149. Summary: Mynas and their association with reserves. Savage, J. (Bird Gard). 2004. Subject: Re: [Aliens-L] Dealing with Common Mynas (Acridotheres tristis). Email communication. Tidemann, C. 2007a. Common Indian Myna Website > Home. The Australian National University. 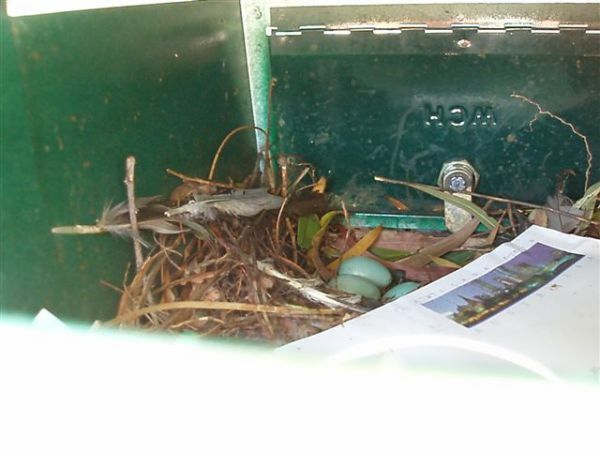 Summary: Useful information, including how to trap and humanely dispose of mynas. Limited stocks of myna traps are available for sale - if you wish to purchase a trap please express interest via the web site. If you represent a group and would like your web site to be linked to the anu myna site - please email myna@anu.edu.au with Myna Group in the subject line and the url of your web site in the text of the message. Please keep your message brief. Tidemann, C. 2007e. Common Indian Myna Website > Minimising Mynas: Mitigation of the impact of Mynas on biodiversity and public amenity. The Australian National University. Summary: The web site provides information on a new, expanded, trial of myna traps in Canberra suburbs commencing in March 2004. Tidemann, C. 2007f. Common Indian Myna Website > Trapping Mynas: Humane bird trap for Common Indian Mynas and European Starlings. The Australian National University. Tidemann, C. 2007g. Common Indian Myna Website > Humane Disposal. The Australian National University. Tidemann, C. 2007h. Common Indian Myna Website > Monitoring Mynas. The Australian National University. Tindall, S.D., C.J. Ralph & M.N. Clout. 2007. Changes in bird abundance following common myna control on a New Zealand island, Pacific Conservation Biology 13(3): 202-212. Wildland Consultants. 2000. Norske Skog Tasman Wildlands: Wetland Restoration Project. Summary: Integrated management of myna by the restoration of vulnerable island ecosystems. Australian Museum. 2003. Common Myna Acridotheres tristis. Beichle, U. R. 1989. Common myna on Upolu: first record for the Western Samoa Islands. Elepaio 49: 85�86. Bull, P.C. ; Gaze, P.D. ; Robertson, C.J.R. 1985. The Atlas of Bird Distribution in New Zealand. Ornithological Society of New Zealand. Byrd, G. V. 1979. Common myna predation on wedge-tailed shearwater eggs. Elepaio 39: 69�70. CIMAG. Undated. Indian myna: the Flying Cane Toad. Cook Islands Biodiversity Database. Undated. Acridotheres tristis Manu Kavamani, Common Myna. Cook Islands Biodiversity & Natural Heritage. Counsilman, J.J., Nee, K., Jalil, A.K. and Keng, W.L. 1994. Discriminant Analysis of Morphometric Characters as a Means of Sexing Mynas, Journal of Field Ornithology, Vol. 65(1): 17. Summary: In depth study of physical differences between male and female mynas. CSN 1972. Classified Summarised Notes. Notornis 23: 89. CSN 1974. Classified Summarised Notes. Notornis 25. CSN 1981. Classified Summarised Notes. Notornis 28: 77. CSN 1984. Classified Summarised Notes. Notornis 31: 55. CSN 1994. Classified Summarised Notes, North Island. Notornis 41: 49. Dhami, M.K. & Nagle, B. 2009. Review of the Biology and Ecology of the Common Myna (Acridotheres tristis) and some implications for management of this invasive species. PII (Pacific Invasives Initiative). Drent R. 1996. Myna eradication boosts tuis. Sunday Star Times 4, August 1996. Feare, C. & Craig, A. 1998. Starlings and mynas. Christopher Helm (A & C Black), London, United Kingdom. 285 pp. Fleischer, R.C., R.N. Williams & A.J. Baker. 1991. Genetic Variation within and among Populations of the Common Myna (Acridotheres tristis) in Hawaii, Journal of Heredity 82: 205-208. Foster, J.T. & S.K. Robinson. 2007. Introduced Birds and the Fate of Hawaiian Rainforests, Conservation Biology 21(5): 1248-1257. Gibson-Hill, C. A. 1949. An annotated checklist of the birds of Malaya. Bulletin of Raffles Musuem 20:1-299. Gill, B. J. 1999. 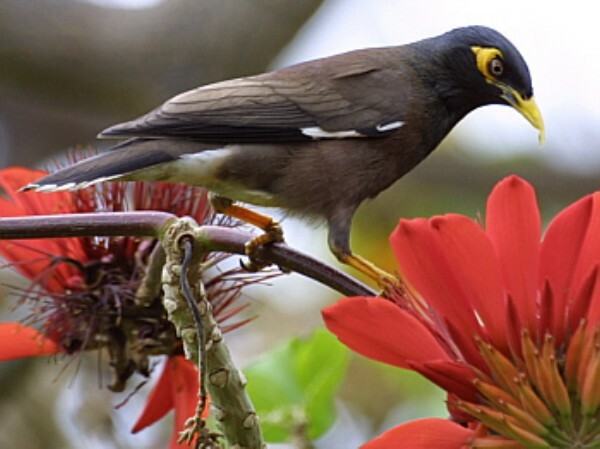 A myna increase � notes on introduced mynas (Acridotheres) and bulbuls (Pycnonotus) in Western Samoa. Notornis 46: 268�269. Government of Western Australia Undated. 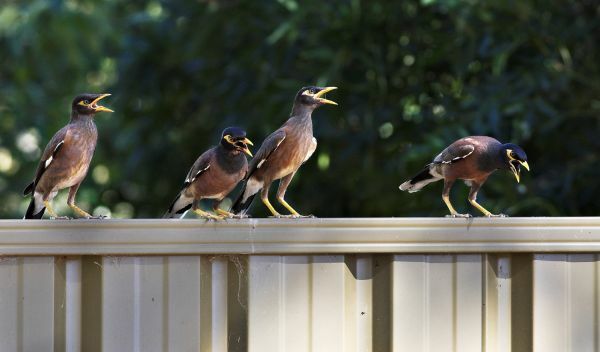 National Pest Animal Alert: Common Myna. Government of Western Australia Department of Food and Agriculture. Griffin, A.S. 2009. Temporal Limitations on Social Learning of Novel Predators by Indian Mynahs, Acridotheres tristis, Ethology 115:287-295. Griffin, A.S. & H.M. Boyce. 2009. Indian mynahs, Acridotheres tristis, learn about dangerous places by observing the fate of others, Animal Behaviour 78: 79-84. Summary: Overview of control measures in place in Israel against the common myna c. 2001. Holyoak, D. T. and Thibault, J. C. 1984. Contribution a l��tude des Oiseaux de Polyn�sie Orientale. M�moires du Mus�um National d�Histoire Naturelle, n.s. S�rie A, Zoologie, Tome 127. �ditions du Museum, Paris. Kang, N. 1989. Comparative behavioural ecology of the mynas, Acridotheres tristis (Linnaeus) and A. javanicus (Cabanis) in Singapore. PhD thesis, National University of Singapore. Landcare Research (LCR). 2008. Garden Bird Survey. Landcare Research, New Zealand. Lever, C. 1987. Naturalized birds of the world. Longman Scientific and Technical, London. Lever, C. 1994. Naturalized Animals: the Ecology of Successfully Introduced Species. London: T. & A. D. Poyer. Live Arico. Undated. Min� com�n - Common myna. Martin, W.K. 1996. The Current and Potential Distribution of the Common Myna Acridotheres tristis in Australia, Emu 96: 166-173. Massam, M. 2001. Common myna [Farmnote No. 61/2001]. Department of Agriculture (Western Australia). McAllan, I.A.W. & D. Hobcroft. 2005. The further spread of introduced birds in Samoa, Notornis 52: 16-20. Mc Kenzie H.R. 1979. A history and account of the birds of the Hunua Ranges. Notornis 26: 105-119. Monson, V. 2005. Bio-control the Last Resort for Hawaii�s Plants, The Maui News. Summary: Mentions the role of the common myna on the spread of invasive plants in Hawaii (which are a major threat to the survival of Hawaii s native flora). Mus�um national d Histoire naturelle [Ed]. 2003-2006 . Acridotheres tristis. Inventaire national du Patrimoine naturel, site Web : http://inpn.mnhn.fr. Document t�l�charg� le 28 mars 2008 . Newey, Philip. 2007. Foraging behaviour of the Common Myna (Acridotheres tristis) in relation to vigilance and group size, Emu 107: 315-320. Newsome, A.E. & Noble, I.R. 1986. Ecological and physiological characters of invading species. Pp. 1-20 in Ecology of Biological Invasions: An Australian Perspective. Eds R.H. Groves & J.J. Burdon. Australian Academy of Science, Canberra. Pell, A.S. & C.R. Tidemann. 1996. The Ecology of the Common Myna in Urban Nature Reserves in the Australian Capital Territory, Emu 97: 141-149. Pierce R.J.; Blanvillain C. 2000. Conservation of the Tahiti flycatcher (Pomarea nigra): report on advice provided to Societe d�Ornitologie de Polynesie. Conservation Advisory Science Notes 290. Department of Conservation, Wellington. 8 pp. Science Centre. Undated. Faunal Wealth of Andaman & Nicobar Islands. Seitre, R. & Seitre, J. 1992. Causes of land-bird extinction in French Polynesia. Oryx, 26, 215-222. Summary: Les auteurs ont rassembl� des donn�es �cologiques sur les oiseaux terrestres end�miques, les animaux introduits et les habitats. Avec la chasse et la destruction des habitats, les introductions de pr�dateurs ont jou� un r�le majeur dans la r�gression et l extinction de plusieurs esp�ces d oiseaux. L �radication rapide de ces pr�dateurs, associ�e � des re-introductions d oiseaux, constituerait la mani�re la plus efficace pour assurer la survie des esp�ces restantes. Stoner, D. 1923. The Mynah. A Study in Adaptation, Auk 40(2): 328-330. Summary: Comments on myna impacts in Fiji. The Cook Islands Natural Heritage Trust. 2005. Acridotheres tristis: Manu Kavamani (Common Myna). Thibault, J.C., 1998. Extrait du compte-rendu de la seconde mission. Te Manu 25, 2. Thomas, A. 2004. Myna Fightback, In Scribbly Gum, ABC. 2005. Summary: Article on trapping mynas. Tidemann, C. 2005. Common Myna. The Australian National University. Tidemann, C. 2007b. Common Indian Myna Website > Identiying Mynas. The Australian National University. Tidemann, C. 2007c. Common Indian Myna Website > Myna Problems. The Australian National University. Tidemann, C. 2007d. 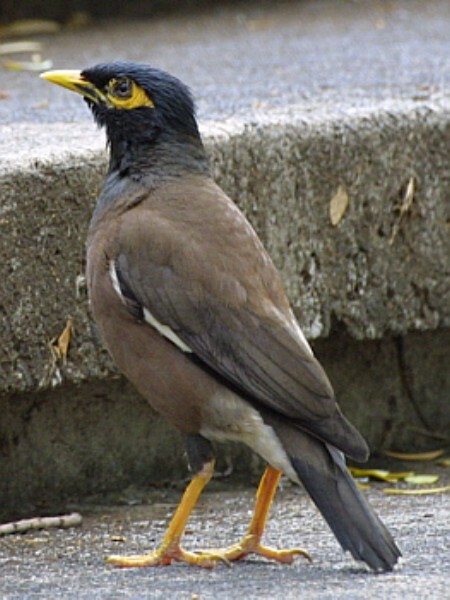 Common Indian Myna Website > Are Mynas spreading?. The Australian National University. van Rensburg, B.J., D.S. Peacock & M.P. Robertson. 2009. Biotic homogenization and alien bird species along an urban gradient in South Africa, Landscape and Urban Planning. Yap, C. A. M., N. S. Sodhi & B. W. Brook. 2002. Roost characteristics of invasive mynas in Singapore. Journal of Wildlife Management 66: 1118-1127.